Early in the morning, Abu-d Dardaa awoke and went straight to his idol which he kept in the best part of his house. He greeted it and made obeisance to it. Then he anointed it with the best perfume from his large shop and put on it a new raiment of beauti ful silk which a merchant had brought to him the day before from Yemen. When the sun was high in the sky he left his house for his shop. On that day the streets and alleys of Yathrib were crowded with the followers of Muhammad returning from Badr. With them were several prisoners of war. Abu-d Dardaa surveyed the crowds and t hen went up to a Khazraji youth and asked about the fate of Abdullah ibn Rawahah RA. "He was put through the most severe tests in the battle," "but he emerged safely..."
Abu-d Dardaa was clearly anxious about his close friend, Abdullah ibn Rawahah RA. Everyone in Yathrib knew the bond of brotherhood which existed between the two men from the days of Jahiliyyah, before the coming of Islam to Yathrib. When Islam came to the city, Ibn Rawahah RA embraced it but Abu-dDardaa rejected it. This however did not rupture the relationship between the two. Abdullah ibn Rawahah RA kept on visiting Abu-d Dardaa and tried to make him! see the virtues, the benefits and the excellence of Islam. "As-salaamu alayki - Peace be unto you, servant of God." "Wa alayka-s salaam - And unto you be peace, O brother of Abu-d Dardaa." "Where is Abu-d Dardaa?" he asked. "He has gone to his shop. It won't be long before he returns." "Would you allow me to come in?" "Make yourself at home," she said and went about busying herself with her household chores and looking after her children. 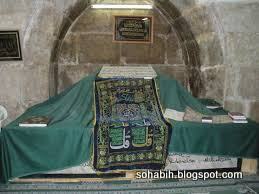 Abdullah ibn Rawahah RA went to the room where Abu-d Dardaa kept his idol. He took out an axe which he had brought with him and began destroying the idol while saying: "Isn't everything batil which is worshipped besides Allah?" When the idol was completely smashed, he left the house. Abu-d Dardaa's wife entered the room shortly afterwards and was aghast at what she saw. She smote her cheeks in anguish and said: "You have brought ruin to me, Ibn Rawahah." When Abu-d Dardaa returned home, he saw his wife sitting at the door of the room where he kept his idol. She was weeping loudly and she looked absolutely terrified. "What's wrong with you?" he asked. "Your brother Abdullah ibn Rawahab visited us in your absence and did with your idols what you see." Abu-d Dardaa looked at the broken idol and was horrified. He was consumed with anger and determined to take revenge. Before long however his anger subsided and thoughts of avenging the idol disappeared. Instead he reflected on what had happened and said to himself: "If there was any good in this idol, he would have defended himself against any injury." He then went straight to Abdullah ibn Rawahah RA and together they went to the Prophet, peace be on him. There he announced his acceptance of Islam. He was the last person in his district to become a Muslim. 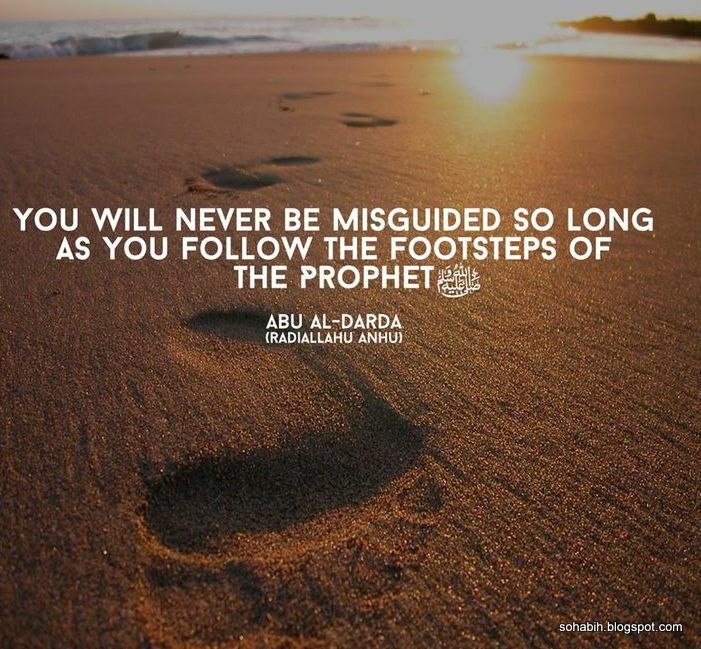 From this time onwards, Abu-d Dardaa RA devoted himself completely to Islam. 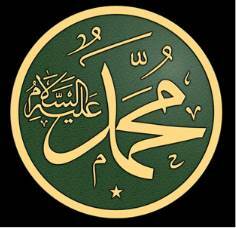 Belief in Allah SWT and His Rasul animated every fibre of his being. He deeply regretted every moment he had spent as a mushrik and the opportunities he had lost to do good. 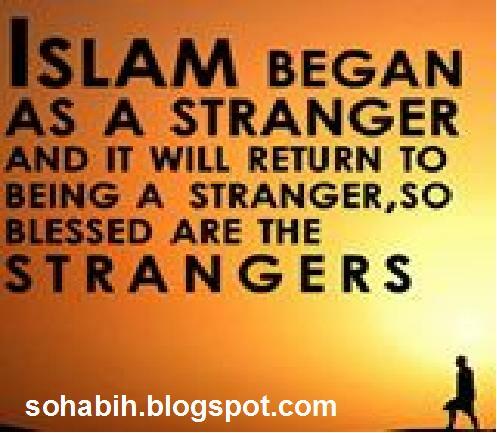 He realize d how much his friends had learnt about Islam in the preceding two or three years, how much of the Quran they had memorized and the opportunities they had to devote themselves to Allah SWT and His Rasul . He made up his mind to expend every effort, day and night to try to make up for what he had missed. Ibadah occupied his days and his nights. His search for knowledge was restless. Much time he spent memorizing the words of the Quran and trying to understand the profundity of its message. When he saw that business and trade disturbed the sweetness of his ibadah and kept him away from the circles of knowledge, he reduced his involvement without hesitation or regret. Someone asked him why he did this and he replied: "I was a merchant before my pledge to the Rasululullah SAW , may Allah SWT bless him and grant him peace. 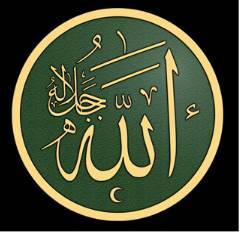 When I became a Muslim, I wanted to combine trade (tijarah) and worship (ibadah) but I did not achieve what I desired. So I abandoned trade and inclined towards ibadah. "By Him in whose hand is the soul of Abu-d Dardaa, what I want to have is a shop near the door of the masjid so that I would not miss any Solah with the congregation. Then I shall sell and buy and make a modest profit every day." 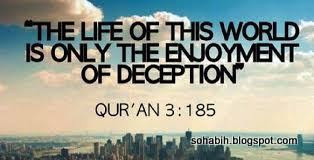 "I am not saying," said Abu-d Dardaa RA to his questioner, "that Allah Great and Majestic is He has prohibited trade, but I want to be among those whom neither trade nor selling distracts form the remembrance of God ." Abu-d Dardaa RA did not only become less involved in trade but he abandoned his hitherto soft and luxurious life-style. He ate only what was sufficient to keep him upright and he wore clothes that wassimple and sufficient to cover his body. Once a group of Muslims came to spend the night with him. The night was bitterly cold. He gave them hot food which they welcomed. He himself then went to sleep but he did not give them any blankets. said: "I will go and talk to him." "Don't bother him," said another. However, the man went to Abu-d Dardaa RA and stood at the door of his room. He saw Abu-d Dardaa RA lying down. His wife was sitting near to him. They were both wearing light clothing which could not protect them from the cold and they had no blankets. Abu-d Dardaa RA said to his guest: "If there was anything we would have sent it to you." During the caliphate of Umar RA , Saidina Umar RA wanted to appoint Abu-d Dardaa RA as a governor in Syria. Abu-d Dardaa refused. Saidina Umar RA persisted and then Abu-d Dardaa RA said: "If you are content that I should go to them to teach them the Book of their Lord and the Sunnah of their Prophet and pray with them, I shall go." Saidina Umar RA agreed and Abu-d Dardaa RA left for Damascus. There he found the people immersed in luxury and soft living. This appalled him. He called the people to the masjid and spoke to them: "O people of Damascus! You are my brethren in religion, neighbors who live together and helpers one to another against enemies. "O people of Damascus! What is it that prevents you from being affectionate towards me and responding to my advice while I do not seek anything from you. 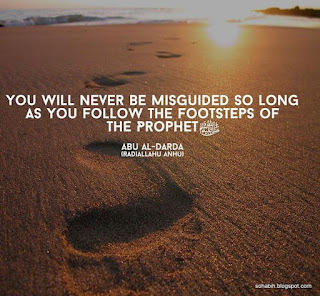 Is it right that I see your learned ones departing (from this world) while the ignorant among you are not learning. I see that you incline towards such things which Allah has made you answerable for and you abandon what He has commanded you to do. 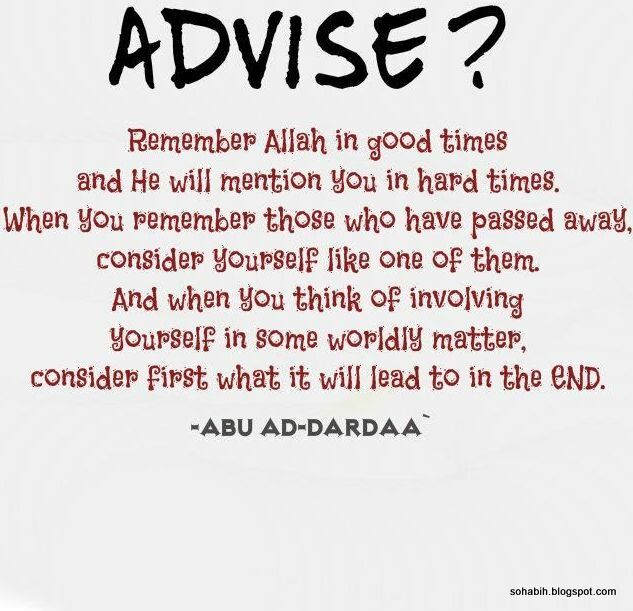 Advise and Reminder to all of us from Abu Dardaa RA. "Is it reasonable that I see you gathering and hoarding what you do not eat, and erecting buildings in which you do not live, and holding out hopes for things you cannot attain. "Peoples before you have amassed wealth, made great plans and had high hopes. But it was not long before what they had amassed was destroyed, their hopes dashed and their houses turned into graves. Such were the people of Aad, O people of Damascus. They filled the earth with possessions and children. "Who is there who will purchase from me today the entire legacy of Aad for two dirhams?" The people wept and their sobs could be heard from outside the masjid. From that day, Abu-d Dardaa RA began to frequent the meeting places of the people of Damascus. He moved around in their marketplaces, teaching, answering questions and trying to arouse anyone who had become careless and insensitive. He used every opportunity and every occasion to awaken people, to set them on the right path. Once he passed a group of people crowding around a man. They began insulting and beating the man. He came up to them and said: "What's the matter?" "This is a man who has committed a grave sin," they replied. "What do you think you would do if he had fallen into a well?" asked Abu-d Dardaa RA "Wouldn't you try to get him out?" "Certainly," they said. "Don't insult him and don't beat him. Instead admonish him and make him aware of the consequences of what he had done. 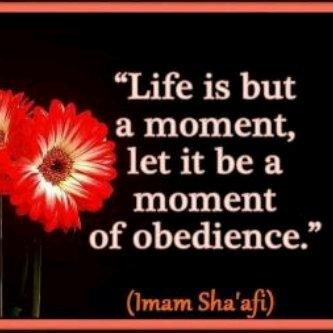 Then give praise to Allah SWT Who has preserved you from falling into such a sin." "Don't you hate him?" they asked Abu-d Dardaa. "I only detest what he had done and if he abandons such practice, he is my brother." The man began to cry and publicly announced his repentance. A youth once came up to Abu-d Dardaa RA and said: "Give me advice, O companion of Rasul the messenger of Allah.” and Abu-d Dardaa RA said to him: "My son, remember Allah in good times and He will remember you in times of misfortune”, "My son, be knowledgeable, seek knowledge, be a good listener and do not be ignorant for you will be ruined”, "My son, let the masjid be your house for indeed I heard Rasulullah SAW say: The masjid is the house of every Allah conscious person and Allah Almighty has guaranteed serenity, comfort, mercy and staying on the path leading to His pleasure, to those for whom masjids are their houses." On another occasion, there was a group of people sitting in the street, chatting and looking at passers-by. Abu-d Dardaa RA came up to them and said: "My sons, the monastery of a Muslim man is his house in which he controls himself and lowers his gaze. Beware of sitting in market-places because this fritters away time in vain pursuits." While Abu-d Dardaa RA was in Damascus, Muawiyah ibn Abi Sufyan, its governor, asked him to give his daughter in marriage to his (Muawiyah's) son, Yazid. Abu-d Dardaa RA did not agree. Instead he gave his daughter in marriage to a young man from among the poor whose character and attachment to Islam pleased him. People heard about this and began talking and asking: Why did Abu-d Dardaa RA refuse to let his daughter marry Yazid? The question was put to Abu-d Dardaa RA himself and he said: "I have only sought to do what is good for ad-Dardaa." That was his daughter's name. "How?" enquired the person. "What would you think of ad-Dardaa if servants were to stand in her presence serving her and if she were to find herself in palaces the glamor of which dazzled the eyes? What would become of her religion then?" "Shouldn't I make things more comfortable for you? Shouldn't I send something for you?" 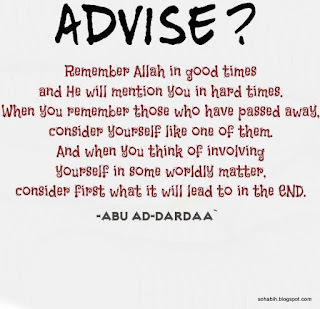 "Do you remember, Umar," said Abu-d Dardaa RA, "a hadith which Rasulullah SAW ,told us?" "What is it?" asked Saidina Umar RA. "Did he not say: Let what is sufficient for anyone of you in this world be like the provisions of a rider? " "Yes," said Umar RA. "And what have we done after this, O Umar?" asked Abu-d Dardaa RA. Both men wept no doubt thinking about the vast riches that had come the way of Muslims with the expansion of Islam and their preoccupation with amassing wealth and worldly possessions. With deep sorrow and sadness, both men continued to reflect on this situation until the break of dawn.